The last 2 weeks of postings was filled with some deep fried fun, but the next 3 weeks will be concentrating on Greek Food. Thanks to my friend Whisper, I have to come to love Hummus, I know this being said by the girl who proclaims to hate veggies. My love for her homemade hummus made me want to branch out and try it myself and in turn I found many other Greek items I wanted to try and share with all of you. I will keep you all on the edge of your seat wondering just what we will be creating for this fun affair. I can tell you that today's posting is homemade hummus, but not just 1, Oh No, we have made 3 kinds of hummus for you to enjoy. Saute onion and garlic in oil and butter until soft and golden in color, this takes about 15 minutes. Place drained peas into the food processor along with all other ingredients except the EVOO. Put the lid on the machine and turn it on low to break up the beans. Then turn onto high and slowly drizzle in the EVOO. Let the machine run until you have a nice smooth consistency. Serve with pita bread or chips. Place all ingredients other than the EVOO into the bowl of a food processor, place the lid on and turn it onto low to break up the peas. Turn the machine onto high and slowly drizzle in the EVOO, let the machine run until smooth and creamy. Serve with pita bread or chips. Into the bowl of a food processor place the peas and artichoke hearts ( liquid too ) and put the lid on. Process on low until the peas are broken down. Turn the machine on high and drizzle in the EVOO, let the machine run until smooth and creamy. Serve with chips and pita bread. Hey Marybeth! Thanks for stopping by and adding me! I love hummus and appreciate these recipes! The last one with artichokes is my fav! I have yet to try hummus but we're having a bbq this weekend and I just might make this , thanks! Now I am messed up, which one did I adore? thanks again for sharing and letting us store the motorcycle! I've never tried hummus before. The one made with artichokes sounds delicious! Wonderful hummus recipes! Love all three flavors! I love Greek food and am looking forward to your recipes, MaryBeth. Hummus is one of my favorites. I've never added artichokes before. Something new to try, Yay. 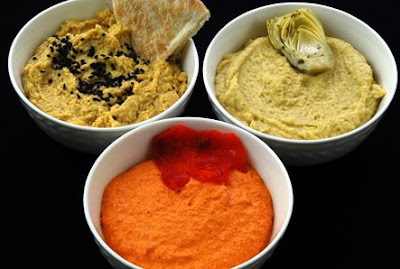 After horsradish hummus, roasted red pepper is a close second - thanks for sharing the recipes! red pepper for me, please, although i wouldn't turn away the others. my favorite is sun-dried tomato--you should give it a go next! I think the roasted red pepper one is my favorite.. They all look wonderful, but that would be my top choice. Love the color on it also!! I love hummus, yours looks great! Can't wait to see what other greek recipes you make. Oh my goodness, I don't know which one I'd try first, they all look so great. I LOVE hummus! Hummus is the best! There are just so many possibilities. How could you ever get bored? I adore hummus! These look so delish and I especially love the sound and look of Caramilised Onion Hummus. These three hummus flavours all sound really good!